Swedish fashion giant H&M said on Monday that it would consider raising retail prices in order to pay better wages to some of the world’s poorest textile workers. The announcement came at a meeting with pressure groups in Stockholm where H&M unveiled plans to improve pay rates for textile workers in countries such as Bangladesh where the minimum wage is less than $70 a month. Helena Helmersson, head of sustainability at H&M, told AFP that higher retail prices “might be a possibility” in the long term but that customers should not expect any price hikes in the near future. Glenn Perry breaks the world record to draw media attention to the plight of the victims of the recent typhoon in the Philippines. This week the United Nations Educational, Scientific and Cultural Organisation (UNESCO) added the Parranda de San Pedro to the Representative List of the Intangible Heritage of Humanity. The Parranda de San Pedro is a traditional festival celebrated in the towns of Guarenas and Guatire in Miranda state on the Feast Day of San Pedro. Kazakhstan state-run company Tau-Ken Altyn plans to launch a new gold refinery in Astana, the country’s capital city, capable of 25 tons of gold and 50 tons of silver a year, 1prime.ru reports, citing the company’s director Meiramgali Tleuzhanov as saying. “The official launch is December 10. President Nazarbayyev will be among those in attendance”, Mr. Tleuzhanov said. In the first two years all the gold to be produced will be sold exclusively to the National Bank of Kazakhstan. Later the facility may start producing jewelries. The production capacities can be brought up to 70-75 tons. The investments are estimated at $30 million. USA, Oita Prefecture–A civic group here discovered and released aerial footage of U.S. fighters conducting air raids on Nagasaki before the Aug. 9, 1945, atomic bombing of the southern port city. 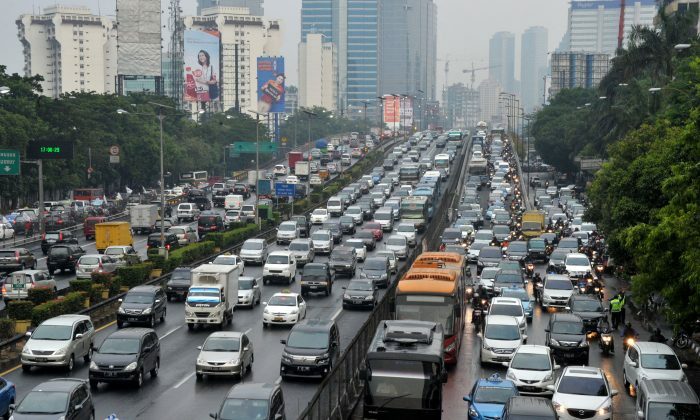 A transportation expert from the University of Indonesia has said that there would never be enough streets in Jakarta to handle all the vehicles inside the city, much less other vehicles coming from its surrounding suburbs. A growing number of Finnish companies are aiming to enter the mobile apps market with products other than games, such as smartphone and tablet applications focused on health and on education.